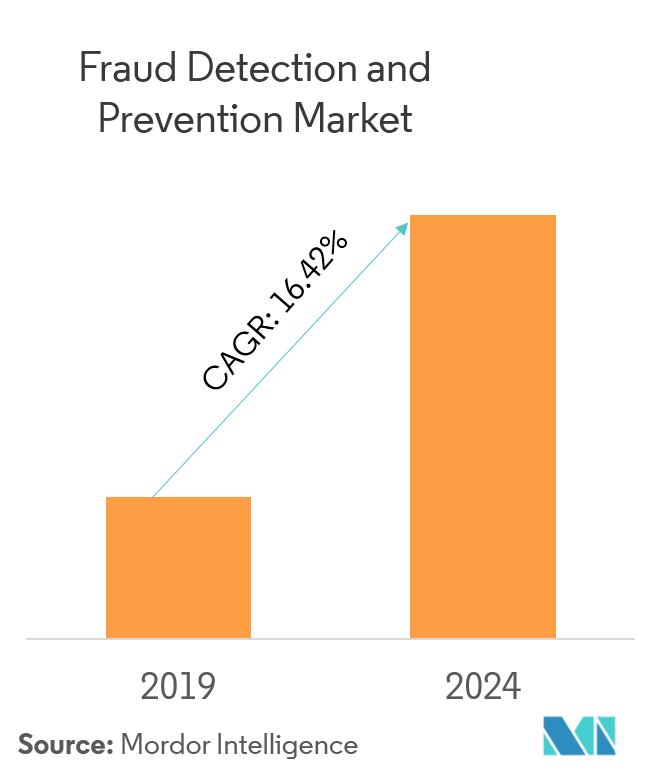 The global fraud detection and prevention market was valued at USD 13.59 billion in 2018 and is expected to reach USD 31.15 billion by 2024, recording a CAGR of 16.42%, over the forecast period of (2019-2024). The market is segmented by Solution (Fraud Analytics, Authentication, Governance, Risk, and Compliance (GRC), Reporting, and Visualization), Fraud Type (Internal and External), Scale of End User (Small, Medium, and Large), End User (BFSI, Retail, Healthcare), and Region - Growth, Trends and Forecast (2019 - 2024). The global fraud detection and prevention market was valued at USD 13.59 billion in 2018 and is expected to reach USD 31.15 billion by 2024, recording a CAGR of 16.42%, over the forecast period of 2019-2024. The fundamental shift from physical cards, checks, and currency to digital payments, continues to transform the way consumers and businesses transfer value. Identity, security, and trust are fundamental requirements for payments, commerce, and finance, especially in a digitized economy. 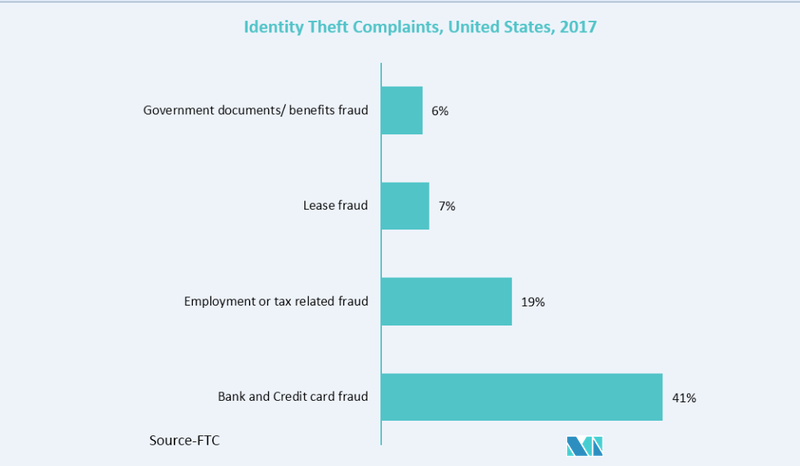 For consumers, data breaches typically mean identity theft. Once compromised, fraudsters can make fraudulent purchases, manipulate listing information, create fake reviews, or change account information, to divert payouts to their own bank accounts. According to the ‘Internet Organized Crime Threat Assessment’ by the European Cybercrime Centre, non-cash payments are constantly at risk, as fraudsters perceive the online transactions space as a goldmine. For successful implementation, any fraud prevention mechanism has to be well integrated with various verticals (such as banking, insurance, retail, healthcare, transportation, IT, and others) and easily unified to the fraud detection solutions of multiple vendors. Fraud Detection System is a Web-based security solution that can signal the threat of fraud before customers fall prey to the perpetrators. The system analyzes suspicious behavior and produces reports for security and risk mitigation purposes. Unlike network security solutions, the system reports suspicious activity before it escalates into fraud, identity theft or other crimes. The growing technological penetration, coupled with the digital channels, such as internet banking, mobile banking, becoming the prominent choices of customers for banking services, there is a greater need for banks to leverage fraud prevention solutions•Fraud prevention and detection represents the biggest area for concerns for the financial institutions and is likely to become one the prominent drivers for IT spending. The potential risk of fraud is one of the greatest in online payments, which is expected to grow in tandem with the availability of digital customer relationships, as more companies telcos, e-commerce, banks are now offering online payments. Out of all industries, BFSI is most prone to insiders/employees when fraudulent activities are considered. There have been various instances where employees have been accused of fraud (PNB fraud in India, 2018). To prevent these, the industry needs robust fraud detection and prevention solutions. Sophisticated online attacks, such as data breaches and malware are expected to augment the demand for fraud detection solutions. In 2017, authentication solution provider HYPR Corp. received an investment from Mastercard to expand its technology to Mastercard’s ecosystem, as well as major banks and financial institutions. Thus, further such initiatives led by major players in the industry are expected to drive innovation in the authentication solutions. However, BFSI players are facing challenges regarding fraud detection, such as disparate transaction systems, slower fraud detection systems, and high operational costs, which are expected to hamper the market growth. The fraud detection and prevention solution can help prevent any online breach of sensitive data and transactions. 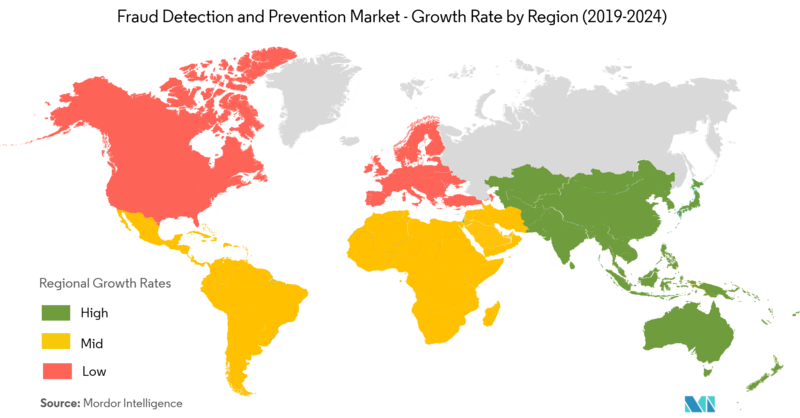 Increasing cases of fraudulent is expected to propel the market growth in the region over the forecast period. In May 2017, Bell Canada, one of the largest telecommunication company, globally, reported that an anonymous hacker illegally accessed data of about 1.9 million customers. Following this, in January 2018, the company reported that data of 100,000 customers was accessed illegally, during a security breach. Cybercrime, such as credit card identity theft, email hacking, account stealing, ransomware, phishing, and DDoS attacks, in the United States and Canada is increasing at an alarming rate, thus, causing monetary losses for enterprises. According to the White House Council of Economic Advisers, about USD 57 billion to USD 109 billion per year is compromised in the US economy, due to malicious cyber activities. As a result, organizations are expected to adopt fraud detection and preventive solutions to mitigate such losses, thereby, driving the market studied, in the region, over the next six years. The market studied comprises several global and regional players, vying for attention in a fairly-contested market space. 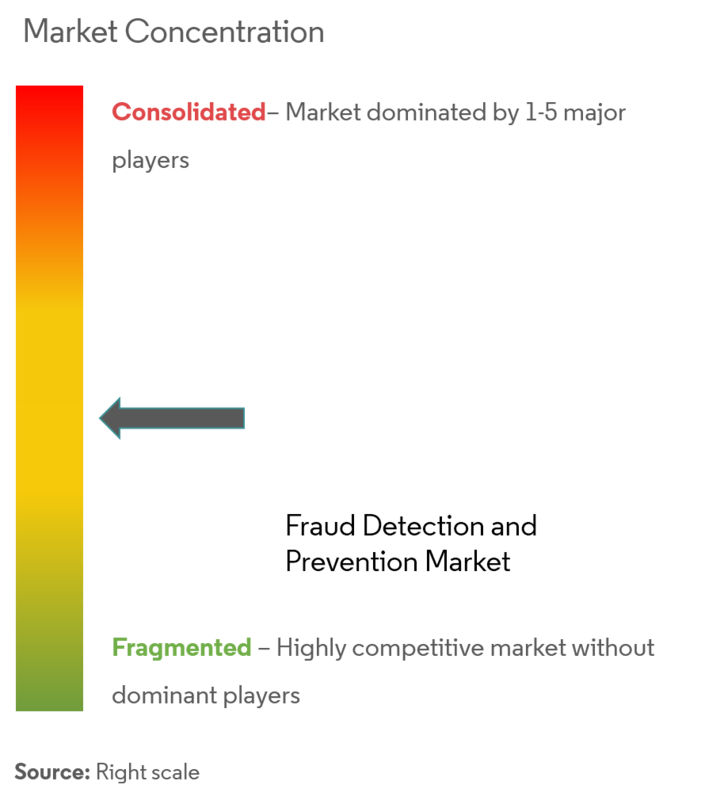 Although the market studied poses high barriers to entry for new players, several new entrants have been able to gain traction, in the market. The firm concentration ratio is expected to record robust growth, over the forecast period. This can be partly attributed to the lucrative opportunity of consolidation of several software firms. 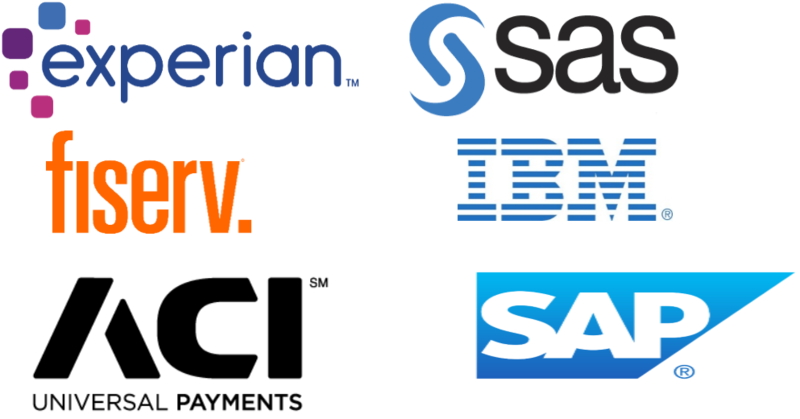 Some of the key players are IBM, SAS, Oracle. Maersk and IBM partnered to form a Joint Venture related to Blockchain to improve global trade and digitize supply chains. The new company will aim to offer a jointly developed global trade digitization platform built on open standards and designed for use by the entire global shipping ecosystem. ACI Worldwide collaborated with Nextpayway, a specialist payment platform solution for the gaming industry, for implementing ACI’s UP eCommerce Payments solution to deliver next-generation payments and fraud prevention.